Advanced oxidation processes (AOP) have gained growing attention as an emerging clean and efficient technology for air and water treatment. The major advantage of this technology is that it can completely or partially destroy organics at ambient temperature by converting them into various harmless intermediates and end products, such as carboxylic acids, carbon dioxide and halide ions. The major oxidants of AOP are hydroxyl radicals and ozone which can react with organic compounds at very high reaction rates. In particular, hydroxyl radicals can attack most organics non-selectively at a reaction rate constant as high as 109 M-1 sec-1 through hydrogen atom abstraction or by addition of the hydroxyl radical. 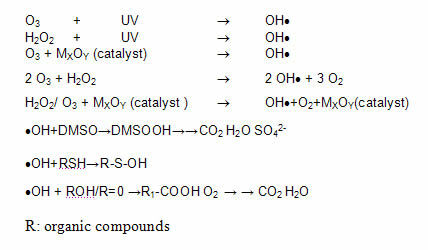 The process offered by ESCO International uses a unique combination of ozone, hydrogen peroxide, a proprietary catalyst and UV oxidation, as shown in the following figure. The new advanced oxidation system design ensures that high concentrations of dissolved oxidants are maintained in the oxidation chamber. The high ozone mass transfer and residual ozone concentrations are made possible due to the use of specifically designed high performance ozone injection devices as well as carefully engineered oxidation chambers. ESCO International AOP system creates a more effective oxidative TOC reduction process compared to known conventional AOP processes. The new AOP system includes new improvements in the system design, allowing reductions in power and capital costs and reductions in chemical use. The combination of state-of-the-art UV and ozone technologies with additional oxidant and catalytic process steps as well as our extensive pilot trials helped us design innovative advanced oxidation processes. A result, the new advanced oxidation process development can be extended to new fields which were previously thought to be unworkable and uneconomical. The new generation of catalytic advanced oxidation technology (CATADOX) was developed, designed and tested by ESCO International. ESCO International and other companies have partnered to market and supply the new AOP-CATADOX process as well as all other newly improved conventional advanced oxidation systems. The technology described here has been recently developed and has been demonstrated both in the laboratory and at commercial sites. ESCO International is a leading knowledge-based solutions provider and an equipment supplier. The company provides technical services, specializing in ozone, UV, advanced oxidation and catalytic oxidation processes. Advanced oxidation processes are reliable means of meeting the new environmental standards. They also offer capital and operating cost savings compared with conventional treatment processes. 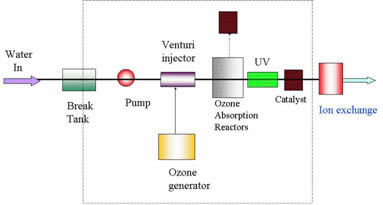 The AOP-CATADOX process (shown in the schematic to the right) combines treatment by ozone, UV, hydrogen peroxide and proprietary catalyst to enable industrial customers to meet the tightening environmental standards for wastewaters and gases. The treated water will then go through either an ion-exchange or GAC bed for further polishing or to a collection tank for reuse/recycle/reclaim. This new process is very effective in challenging applications such as toxic micro-pollutant and non-biodegradable organic compounds, COD and TOC reduction, VOC abatement, toxicity reduction, color and odor removal. Typical organic compounds successfully destroyed by our advanced oxidation processes includes IPA, TMAH, NMP, DMSO, Glycols, VOCs, PAHs, PCBs, EDCs (Endocrine disrupting compounds), PPCPs (Pharmaceuticals & Personal Care Products), API (Active Pharmaceutical Ingredients), Alcohols, Ethers, MTBE, Urea, and many other refractory organic contaminants. The photo below shows an actual AOP-CATADOX system. Depending on the inlet and outlet TOC or COD concentrations and content, the most suitable process design is selected. The ozone to TOC or COD mass ratio depends on a number of factors. 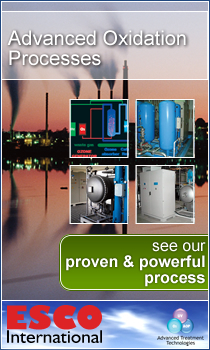 The CATADOX process uses much less ozone than other AOP systems. The CATADOX process therefore can be a cost effective technology to reduce TOC or COD in process water. The use of just O3/UV would be more expensive from the capital cost stand point due to high ozone requirements. Other advantages of the multiple oxidant system are better oxidant availability, shorter contact reaction times, higher TOC/COD reduction performance and much lower operating costs.